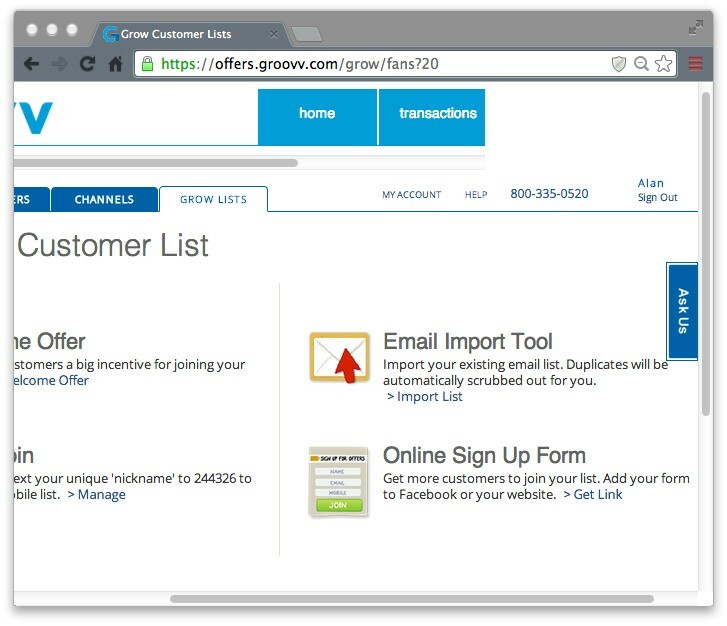 Groovv Offers makes it easy to collect customer contact info online. You can place links to your Online Sign Up Form on your website, Facebook and Twitter – or anywhere you market online – so customers can join your email or mobile list. 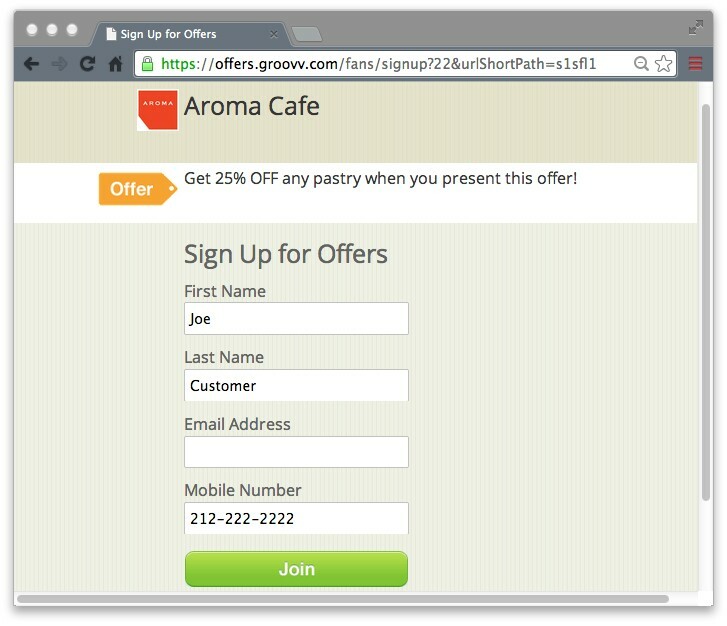 Be sure to include an email Welcome Offer to encourage more customers to join your email list. 1. 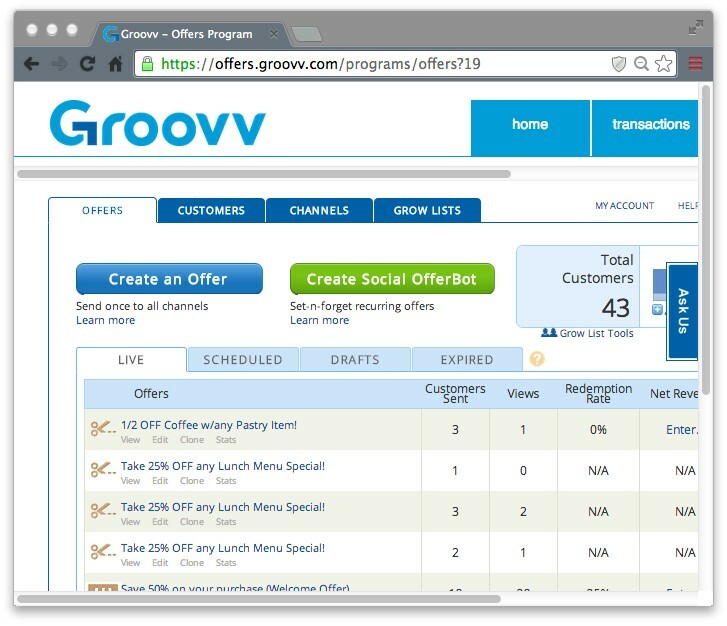 Sign in to Groovv Offers and click the Grow Lists tab. 2. To the right of Online Sign Up Form, Click on > Get Link. 3. Customize & Brand your Sign Up Form. You can include up to 4 fields by checking their respective boxes: First Name, Last Name, Email, and Mobile Phone Number. Brand your form with your company name and upload a company logo if you have one. 4. 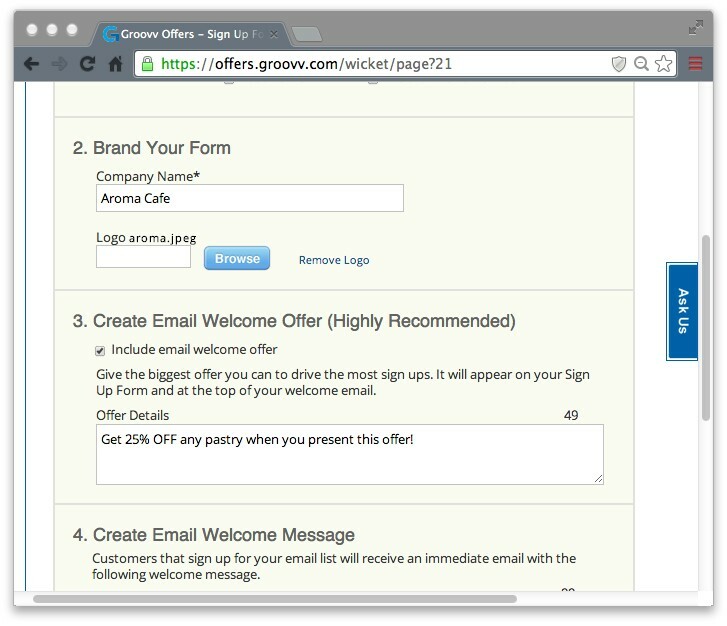 Create an Email Welcome Offer. This step is optional but highly recommended as a way to incent your customers to share their personal information with you. 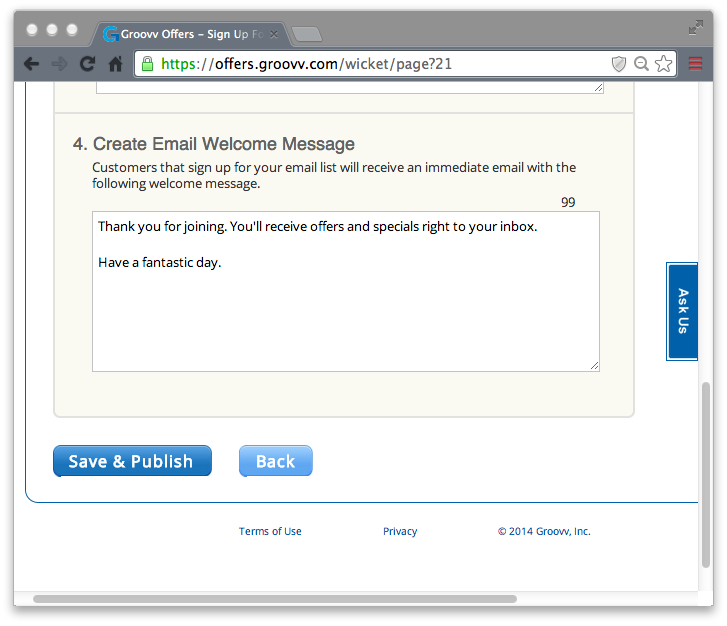 If you include an email welcome offer, customers will receive your offer in their inbox after filling out your form. Note on Welcome Offers: Remember, an Email Welcome Offer will only be sent to customers that include their email address (assuming you included the Email field in your form). If customers include their mobile number, they will receive an auto-reply text asking them to confirm they wish to be opted into your Mobile Customers List the same way they would if they used Text2Join. 5. Create your Email Welcome Message. 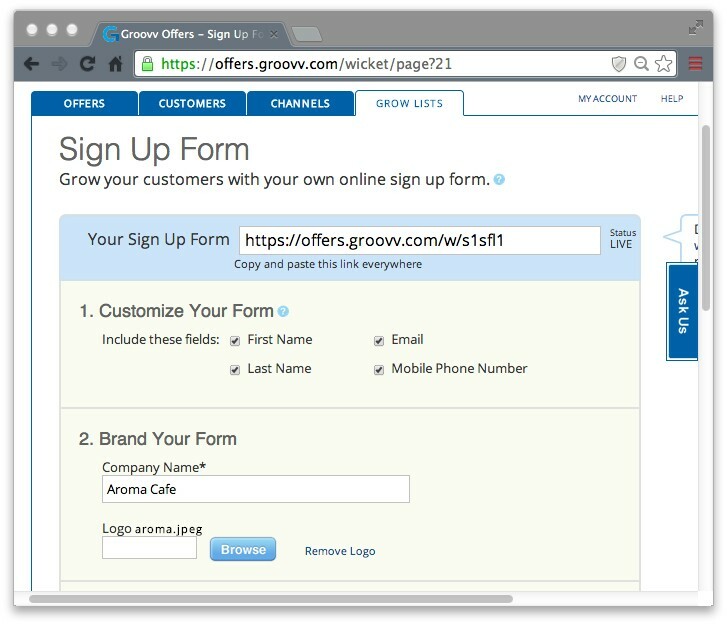 Customers will see your welcome message after successfully completing your form. Feel free to use the default welcome message or customize it. When finished, click the Save & Publishbutton to publish your form. 6. To view your Sign Up Form, copy the URL at the top of your form and paste it into your web browser.